“If it takes a village to raise a child, it takes a village to abuse them,” muses Boston lawyer Mitchell Garabedian (Stanley Tucci), considering Boston’s collective responsibility for avoiding to address sexual abuse of children by members of the clergy. Garabedian seems to speak for writer/director Tom McCarthy and puts forth the central thesis of Spotlight, which looks beyond the church itself to how Boston institutions, including the police and the local paper, The Boston Globe, played a crucial part in maintaining a culture of silence which allowed the most vulnerable to be preyed upon with impunity. After a brief prologue in which an abuse complaint is dismissed (the city prosecutor and police are only too happy to release the priest without charges), Spotlight focuses on the titular specialist reporting team of journalists at The Boston Globe who often spent months or years thoroughly exploring one particular story. When new editor Marty Baron (Liev Schreiber, in a beautifully underplayed role) moves to Boston from Miami, he’s flummoxed by the limited interest in further reporting on clerical abuse. “This strikes me as an essential story for a local paper,” he tells the Spotlight team, who have varying levels of interest in reporting the story. Rabble-rousing reporter Mike Rezendes (Mark Ruffalo) relishes the idea of a fight with authorities while Robbie Robinson (Michael Keaton), who grew up in Boston, attending a Catholic school across from The Globe’s offices, receives subtle nudges from his friends not to get caught up in “Baron’s agenda”. Yet the staff commit to at least investigating several priests and through tedious research, they are able to connect the abuses of local priests with the methods by which the church hierarchy shuffled priests between parishes in order to avoid legal action. The film makes the wise choice not to revel in the painful details of the sexual assaults (although I did consider whether the same choice would have been made if the survivors were adult women), but makes it clear that the survivors paid great personal costs to speak out. The team, aided by survivors’ attorney Garabedian, encounters plenty who self-medicated with drugs and alcohol and mention is made of those who committed suicide. Now adults, most of these survivors have dealt with guilt, shame and humiliation since childhood, unable to find support from their families or communities. One survivor describes his mother’s reaction when a powerful bishop asked his family not to take legal action: “she put out fricking cookies”, he tells the Spotlight team. In one interview with a survivor (who speaks emotionally about the tangle of the abuse and understanding his own sexuality), journalist Sacha Pfeiffer (Rachel McAdams) seeks to clarify a specific point. The survivor practically trips over his own words to reassure her that he didn’t mean to mislead her or leave anything out: he just didn’t know it was relevant. While Pfeiffer is polite and reassuring, it’s a telling moment – survivors are constantly made aware that any small inconsistency may lead their entire narrative to be labelled as unreliable or suspicious. The film never ignores the courage needed for the survivors to come forward. Spotlight is most reflective when it refuses to ignore the collective responsibility that both Boston and The Boston Globe share. The film is quick to make the point that Marty Baron, the first Jewish editor of The Globe, and Mitchell Garabedian, a rare Armenian-American in a city of Irish-American Catholics, were in some ways outside the system and able to shed light on corners long hidden. A startling illustration of this comes in a scene when Pfeiffer interviews a police officer. “I shouldn’t talk about this,” he tells her. She stops to look at him. “I think you should, actually,” she says sharply. It is such a stark reminder of the code of silence that had been imposed and followed – to a point where it became a standard of morality. In an initial meeting with a Boston cardinal, the priest tells Marty that the city flourishes when its great institutions work together. “Personally, I’m of the opinion that for a paper to best perform its function, it needs to stand alone,” he replies. Spotlight is clearly making a statement that is larger than the role of The Boston Globe in uncovering childhood sexual abuse and is intended to encompass the role of the press in holding institutions to account. Yet the film does not make the mistake of portraying the reporters as selfless crusaders. At one point, as they demand the names of abusive priests from a prominent Boston lawyer who works for the clergy (Billy Crudup), the latter retorts that he had sent them to The Globe years ago – and no reporter had followed up on the allegations. The film recognises that in a close-knit society, all institutions and insiders have a vested interest in maintaining the status quo – even if the most vulnerable are left unprotected. Spotlight is an important example of this more universal truth and an essential film for anyone attempting to understand how so many examples of exploitation and abuse remain hidden for so long. Spotlight is on general release now. The picture is from the film’s official Facebook page. It shows six people standing in an office, looking straight into the camera. They are five white men and one white woman, wearing smart casual attire. There’s lettering “The Boston Globe” on the wall in the background. 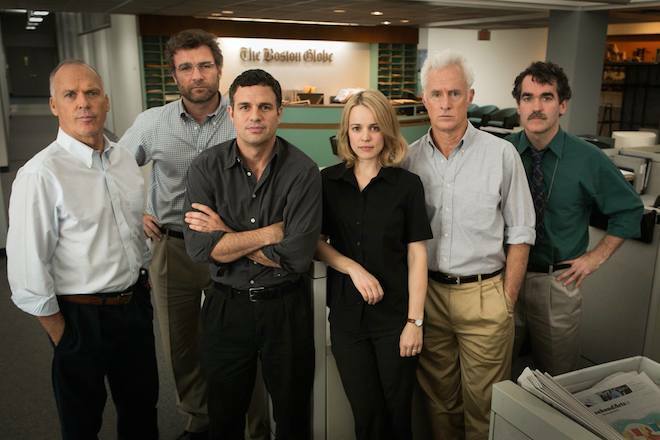 These people are actors portraying the real-life Spotlight team in the film and they are, from left: Michael Keaton (as Walter Robinson), Liev Schreiber (as Marty Baron), Mark Ruffalo (as Mike Rezendes), Rachel McAdams (as Sacha Pfeiffer), John Slattery (as Ben Bradlee Jr) and Brian d’Arcy James (as Matt Carroll). Nick Beard has worked with survivors through crisis helplines for several years. She is currently studying for her PhD and plans to continue advocate work. She lives in London and considers her Picturehouse membership to be more essential than her Oyster card.